There is so much to tell you about our 25+ years of Mixed Martial Arts instruction in Philadelphia and our 12 years in business. Through out the years, we have done so much. Please click on a tab below to explore our history. Do you have 5 minutes? We packed 20 years of history in one slide show video. Balance Studios opened their doors for business in 2002. Since then, the Migliarese brothers and their talented staff have been working hard to educate their students in the arts of Brazilian Jiu-Jitsu, Muay Thai, MMA, and Yoga. The Balance center city location is the headquarters to more than 30 schools around the world. 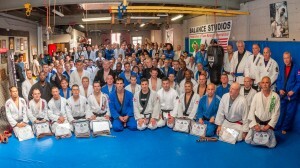 “Balance” is one of the Oldest Gracie schools in the US. 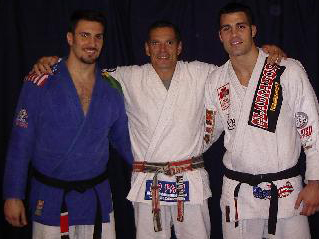 Owners, Ricardo and Phil Migliarese have been training in Brazilian Jiu-Jitsu for more than 20 years and are certified black belts under Master Relson Gracie. The Migliarese brothers currently guide 300+ students in their studios. 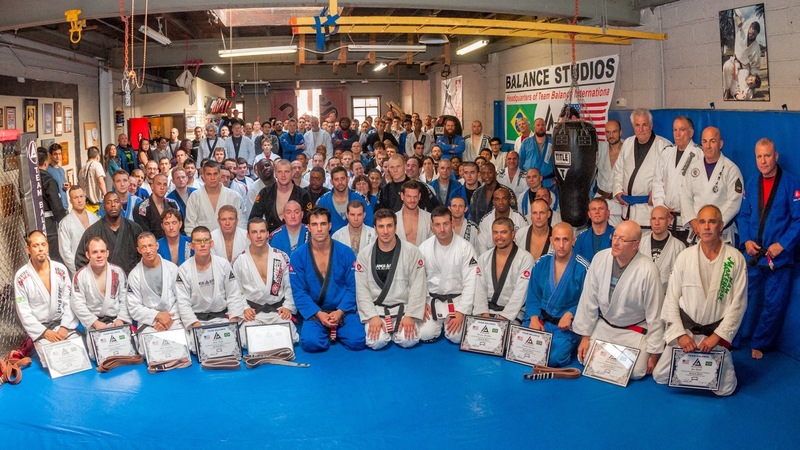 Balance Studios became the Official Gracie Jiu-Jitsu Academy of Philadelphia in 2009 when Relson Gracie (Second oldest son of Helio Gracie) awarded “Academy Status” for upholding the teaching methods of Grandmaster Helio Gracie. Co-owner, Phil Migliarese is a 5th degree black belt under Relson Gracie and is the highest ranking representative of the Gracies in Philadelphia. Atmosphere and Attitude are everything! Team Balance is widely regarded as one of the elite martial arts teams in the world. Currently representing nearly 30 school world-wide, the ever-growing network consists of 5,000 students, all of whom have been carefully selected through limited enrollment to represent Team Balance. Balance Studios, the headquarters of this top-notch team, is located in Philadelphia, PA, and is owned by Phil and Ricardo Migliarese. True American pioneers, the brothers have utilized their 40 years of combined martial arts experience, as well as the knowledge they gained while living and training with the legendary Gracie family, to build Team Balance into a multi-faceted university of the body and mind. The exclusivity of membership fosters a familial environment that is unrivaled amongst competitors, and much sought out by those eager to learn from the best. 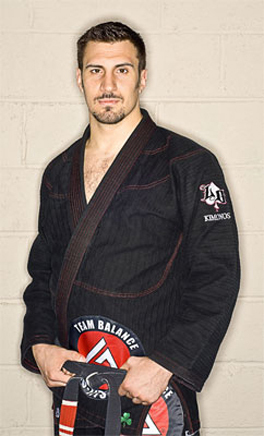 Team Balance fighters run the gamut from average enthusiasts to world champion jiu-jitsu competitors; some are professional fighters who have fought in esteemed mixed martial arts competitions like the UFC, while others have represented Team Balance at the prestigious ADCC championships. Their systematic method of teaching consists of basic, intermediate, and advanced classes in yoga, jiu jitsu, and mixed martial arts, all with the expressed goal of sculpting the individual into a complete fighter. Achieving black belt status as a member of Team Balance is unlike achieving it anywhere else, in that here it represents not only your skills as a jiu jitsu practitioner, but also your ability to strike, your take downs, and your overall character as a human being. Want to Join Team Balance? -Build a TEAM BALANCE PAGE on your website. Phil Migliarese’s introduction to martial arts began with karate classes at the age of 8. By the time he was 12 he had discovered Brazilian jiu jitsu, a virtually unknown style of grappling at the time, but one that would soon transform the martial arts forever. This was before the Ultimate Fighting Championship showcased the effectiveness of jiu jitsu to the world. It was also before the Gracie family, many generations of whom had revolutionized the Japanese form of jiu jitsu since the beginning of the 20th century, went on to become the legendary pantheon of fighters they are today. Those are the people Phil trained with. He went directly to the source. Throughout his years with the Gracies, Phil has become more like a member of the family than a student. 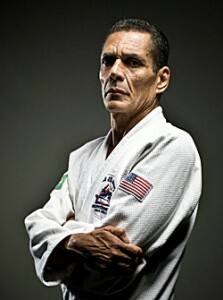 Relson Gracie refers to him as a brother. And rightfully so, considering Phil shared the mat with them before Gracie jiu jitsu became a staple in every self-respecting martial arts studio in the world. He even participated in the legendary challenge matches that were frequent occurrences back when the family first issued the $100,000 challenge. These fights were labeled so because $100,000 was exactly the amount of money they would pay to anyone who could beat the Gracie fighters on the mat. In those days, it was a common occurrence for men who had studied martial arts their entire lives to barge into the Academy and denounce the effectiveness of Gracie jiu jitsu against their own style. When Royce gained popularity with the UFC, he was the guy everybody wanted to fight. In order to get to him, they would first have to go through Phil, or other students like him, to prove that they were up for the challenge. Phil’s first challenge match happened in Philadelphia, when he was just 14 years old. Royce Gracie was in attendance that day, when an adult male karate instructor walked in to the studio with entirely too much confidence in the black belt he wore about his waist. Phil was merely a white belt in jiu jitsu at the time, but had been studying for several months and had already developed a good foundation in the basics. He immediately closed the distance to render his opponents’ strikes ineffective, took him to the ground, and attained the mounted position. Once there, he forced the much larger man to tap in 30 seconds. When Royce informed the man that he had just been beaten by a 14 year old, the man’s bravado deflated, along with any chance of a rematch. Scenes like this played out on a regular basis, and no one ever collected that $100,000. Instead, the challengers received something much more valuable than money – a reality check. If they were wise, they supplemented their training with jiu jitsu. When Phil was 17, he left for Hawaii to live and train with Relson. For 3 months, he lived and breathed jiu jitsu; even carefully following the Gracie diet constructed by Carlos Gracie to ensure that his family of fighters would always be in top physical form. Phil still abides by the diet today. At the end of those 3 months, Phil flew back to Philadelphia, where he concentrated on his studies whenever he wasn’t teaching jiu jitsu. After the semester, he flew back to Hawaii to train for 3 more months before coming home and repeating the cycle all over again. By the time he was 18, he had enough frequent flier miles to add another stop on his journey, and it was then that Phil began training at the Gracie Academy in Torrance, CA. His duties, aside from teaching basic jiu jitsu to beginners, included scrubbing the toilets, sweeping the mats, and generally working as best he could to ensure the place met the meticulous standards of Rorion Gracie. 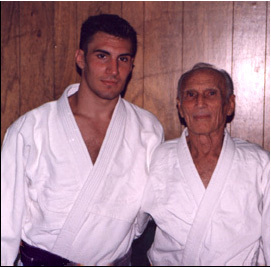 His thoroughness would be tested even further when Grand Master Helio Gracie, Rorion’s father, arrived at the Academy. According to Phil, there was a period of about 3 months where he taught every class at the Gracie Academy; even those ordinarily taught by Royce. Phil was so enmeshed in the family and the studio that he was invited to assist Royce with his jiu jitsu seminars all over the country. During these years, Phil was so excited by the techniques he was learning that he would often rush home and teach them to his younger brother Ricardo, a natural who showed great promise in the style and enjoyed training so much that it wasn’t long before he followed in Phil’s footsteps and headed to the Gracie Academy in Torrance as well. Ricardo has since grown into a true force in the world of jiu jitsu. As much as he is both big and strong, he is that much more technical and perceptive. These combined traits have led to him winning numerous world and national championships. In 1999, he won a world championship medal in the birthplace of Gracie jiu jitsu: Brazil. In 2000, Phil moved back to Philadelphia and took over the Relson Gracie training association in the city. Two years later, Phil and Ricardo opened Balance Studios, which is now the oldest Relson Gracie affiliation on the east coast. Only a year later, Phil became the youngest student ever to have been awarded a black belt by Relson Gracie. And now, five years later, Phil is authorized to bestow that honor himself, as well as certify all 10 levels of instructors. Together the brothers have sculpted Balance Studios into a top notch facility that is widely regarded as one of the best in the world. Ricardo, now a black belt as well, is currently furthering his advantage by studying kinesiology, and before long should know even more ways to twist his competitors into knots. The Migliarese brothers have devised a proven formula of instruction at Balance that caters to students of all ages, genders, sizes, and skill level with classes specially designed to focus on individual needs. They share the philosophy that one must completely repress the ego in order to truly evolve, and because of that, their academy encourages friendship and support like no other. A common saying among jiu jitsu practitioners is that “a black belt is just a white belt who does not quit.” And while the Migliarese brothers’ goal is to impart at least a sample of jiu jitsu to everyone in the world, they want to do so in such a way that their students see no reason to quit. They would like for them to believe what they do – that jiu jitsu is a way of life. 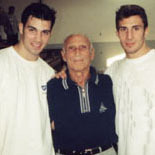 The Migliarese Brothers started learning from Grand Master Hélio Gracie and his son Relson Gracie when they were 12 years old. Both brothers are completely committed to preserving his technique, teaching method, diet and philosophy.